S. A .S. 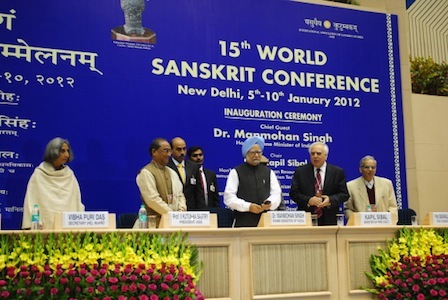 Sarma (EFEO) has delivered a paper at the 15th World Sanskrit Conference held at New Delhi from 5th to 10th January 1012. Summary: Most of the ritual texts produced in Kerala, such as the unpublished Śaivāgamanibandhana, the Prayogamañjarī and the Tantrasamuccaya, concern temples. They consist, in other words, of rituals pertaining to the selection of a suitable location for the construction of the temple and a detailed description of the construction process and the structure of the temple as well as the procedure for the installation of the idols, the daily rituals, festivals etc. Very often they also contain a chapter, usually called ‘Jīrṇoddhāraṇ' or ‘Renovation', devoted to the renovation of the temples. As per the ritual manuals, it is essential that the idol to be installed should be in a perfect condition because it is supposed to hold the divinity invoked until the dissolution of the universe. But the idols in temples can get damaged and then new idols must be installed in place of the old ones. Among the different rituals performed during such a ‘re-installation', the rite of ‘Jīvodvāsan' or ‘the act of extracting the life (jīva) from the idol' and the ‘Bimboddhāraṇa' or ‘uninstalling the damaged idol from its pedestal' are the most important and they can be performed only by an experienced priest. The other rituals that are performed during the re-installation often include the installation of a temporary temple-structure or Bālālaya in which a temporary idol would be installed, Saṃhāratattvahoma, informing learned Brahmins and public about the necessity of replacing the idol, etc. While the installation process (pratiṣṭā) is performed in the ‘order of creation' (sṛṣṭi) through which the presence of God is permeated across the entire temple complex, the ‘extraction of life from the idol' (jīvodvāsana) is performed in the ‘order of destruction' (saṃhāra) through which the presence of the God is first resorbed back into the idol before it is extracted. This paper, which focuses mainly on the rituals related to ‘re-installation' of damaged idols as explained in the ritual texts of Kerala, will also compare them with those of the ritual manuals of other regions.